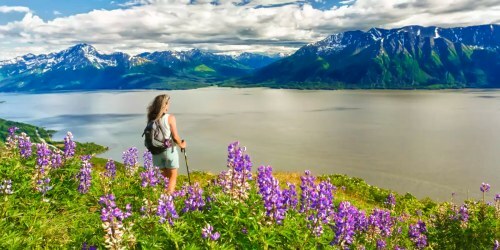 Jet Blue has dropped the price of their summer flights from Seattle to Anchorage, Alaska down to $190 CAD roundtrip including taxes. 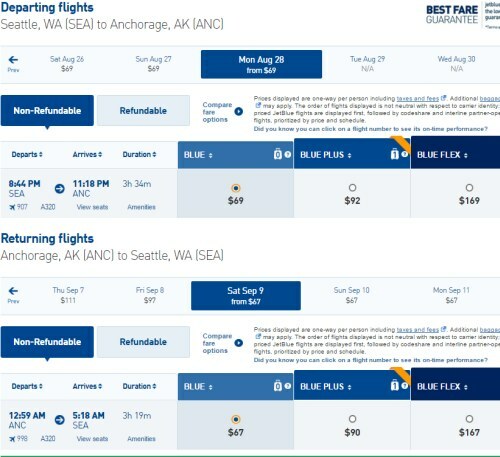 These flights could be worth the drive from Vancouver, as they are over $400 CAD cheaper than the cheapest flights from YVR to Alaska. You may find a booking site that shows this price for $142.50 USD. When booked with a Canadian credit card, this will work out to $190 CAD, based on today's exchange rate, and including the typical credit card foreign exchange fees. You can also try searching at the JetBlue website directly, although prices may be slightly higher. Update 1/17 - A few more August dates from Seattle to Anchorage, Alaska have dropped to $173 CAD roundtrip including taxes. 3. Select your flights in Google Flights and click through to the Jet Blue website. The price on the JetBlue website should be $136 USD roundtrip ($171 CAD roundtrip). screenshot from the JetBlue website. flight deals, seattle, sea, delta, united states, north america, alaska, anc, anchorage and jetblue.